Successful dividend growth investing relies on finding companies at an attractive price which can grow earnings and dividends over time. A long track record of annual dividend increases is an indication of a strong business model that generates a lot of excess cash, beyond the needs for growing the business. This is the characteristic for most of those dividend champions, which shower their shareholders with more cash every year. One of the monitoring tools at my disposal involves checking the list of dividend increases, and analyzing companies every 12 – 18 weeks. I have noticed that several of the companies I own have been unable to grow earnings per share over the past few years. Some recent examples include Coca-Cola, Procter & Gamble and Colgate Palmolive. The list of dividend champions includes companies which have managed to increase dividends every single year for at least 25 years in a row. This is a very rare occurrence, and is indicative of a company that has a unique business model that withstood the test of time. Only a company with a unique set of competitive advantages can manage to grow the business, maintain its dominant industry position, and shower shareholders with more cash every single year for at least a quarter of a century. As of the time of this writing, there are 109 such businesses in the US. The list of Dividend Champions is maintained by David Fish, who is a true superhero for ordinary dividend investors. After obtaining the list every month, I try to get it to a more manageable level by weeding out companies whose dividends are at risk. John Bogle is an investing legend. He is the founder of Vanguard Group, a $4 trillion dollar mutual fund powerhouse. Vanguard is credited for single handedly rolling out the first index mutual fund in 1976. It gave millions of investors around the world the opportunity to invest at a low cost. I have read several of his books, and really enjoyed his simple messages. I really liked Bogle's message on keeping costs low, keeping turnover low, staying the course and keeping it simple. I liked the advice the minute I read it. It makes sense that when you do not pay 1%/year to a greedy asset manager, you have more money working for you. I have been inspired by Bogle to find a way to educate investors and help them get their fair share of returns. For example, building a diversified portfolio of dividend companies will only cost a one time brokerage fee. This means that the investor’s only cost is to buy the diversified list of blue chip stocks for their portfolio. Their job is to then remain patiently invested. That way, they will not have to pay an annual fee for the privilege of someone else picking well-known companies for their portfolios. After all, I do not need to someone else to buy Johnson & Johnson with my money, and charge me an annual fee in the process. This is a well-known business. One of the best vehicles for accumulating a nest egg for ordinary investors is the 401 (k). For most employees of large companies, they get the ability to contribute as much as $18,000/year, and get a tax break in the process. The money is then invested in those 401 (k) plans, and grows tax-free for decades, until it has to be withdrawn at retirement. At that point, the withdrawals are taxed as ordinary income for pre-tax plans, and not taxed for after-tax ones. This is the best way to invest for someone who holds a demanding day job, and spends a lot of time on family affairs, and is not able or willing to dedicate even 10 hours/week on their goal of retirement or financial freedom. This is the best way for probably 80% of employees out there. Those include most investors that probably have no clue about investing, economics, business, the difference between preferred stock and livestock, and are not going to spend the time or effort to learn about it. A very close relative of mine invests entirely in index funds in their 401 (k) and Roth IRA every month, and have ok over the past decade. I have been thinking about it, and think that this is also a very good way to invest for the average self-directed investor. Basically, what I am trying to say is that the ability to defer taxes in a 401 (k) today, enjoy tax-deferred compounding for decades, and earn an employee match on contributions is a more advantageous place for your money than a taxable portfolio. This is because by investing in a taxable portfolio, you are essentially able to place much less money to work for you. In addition, in a taxable account your capital gains and dividends are taxed during your accumulation phase, when your total income is usually at its the highest. Thus, even a portfolio of the best dividend paying stocks has to perform at least a couple percentage points better per year, in order to keep up with the tax-advantaged performance of investments in a 401 (k). In my case, I am getting a 25% effective discount from my purchase price by investing through a tax-deferred account. Realty Income Corporation (O) is a publicly traded real estate investment trust. It invests in the real estate markets of the United States. The firm makes investments in commercial real estate. Realty Income raised its monthly dividend to 21.10 cents/share. This REIT is a dependable dividend achiever which has rewarded shareholders with a raise for 23 years in a row. Realty Income calls itself “The Monthly Dividend Company”. This is a very well run REIT, whose sole purpose is to shower shareholders with monthly dividend checks. I really like the stability of the long-term triple-net type leases that Realty Income uses to rent out its properties. The long-term track record of dividend increases is very impressive. Target Corporation (NYSE:TGT) operates general merchandise stores in the United States and Canada. Target is a dividend champion, which has paid dividends since 1965 and raised them every year for 49 years in a row. The most recent dividend increase was in June 2016, when the Board of Directors approved a 7.10% increase in the quarterly dividend to 60 cents/share. 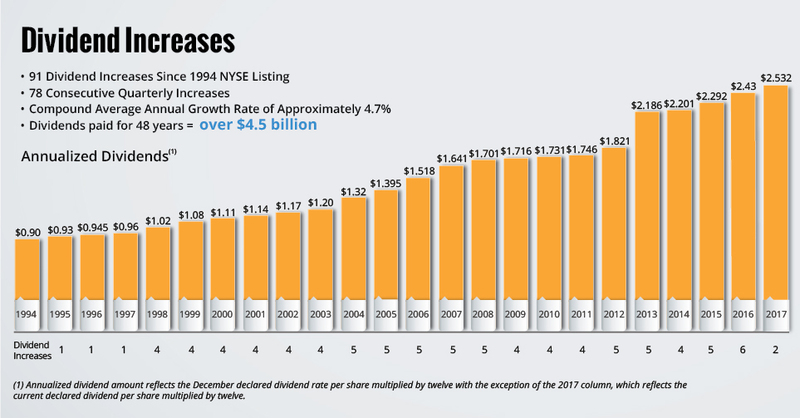 Over the past decade this dividend growth stock has delivered an annualized total return of 1.60% to its shareholders. Future returns will be dependent on growth in earnings and dividend yields obtained by shareholders. More recently, the stock price has been hammered by a decline in earnings expectations. This is why I wanted to take another look at Target. The company has managed to deliver a 3.60% average increase in annual EPS over the past decade. Target is expected to earn $4.01 per share in 2018 and $5.80 per share in 2019. In comparison, the company earned $4.09/share for fiscal year 2017. Bank of Montreal (BMO) provides various retail banking, wealth management, and investment banking products and services in North America and internationally. It has operations in the US, in the form of BMO Harris Bank. Bank of Montreal has paid dividends since 1829. 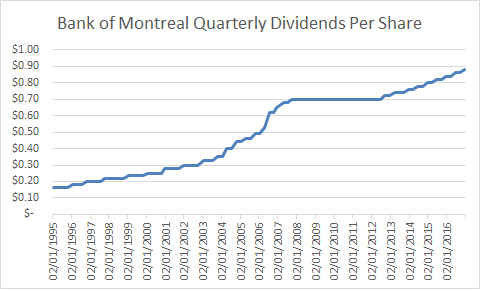 Over the past decade, Bank of Montreal has increased quarterly dividends per share by 3.10%/year. And that’s despite the fact that the dividends were as left unchanged in 2009, 2010 and 2011. Earnings per share have increased by 3%/year over the same time period. The bank sells for 14.90 times earnings and yields 3.40%. Colgate-Palmolive Company, together with its subsidiaries, manufactures and markets consumer products worldwide. The company operates in two segments: Oral, Personal and Home Care; and Pet Nutrition. This dividend king has paid dividends since 1895 and has increased them for 54 years in a row. The company’s latest dividend increase was announced in March 2017 when the Board of Directors approved a 2.60% increase in the quarterly annual dividend to 40 cents /share. This was the slowest rate of dividend increases since 1980. It indicates that the company's management is cautious about Colgate-Palmolive's near term business outlook. The company’s peer group includes Procter & Gamble (PG), Clorox (CLX), and Kimberly Clark (KMB). 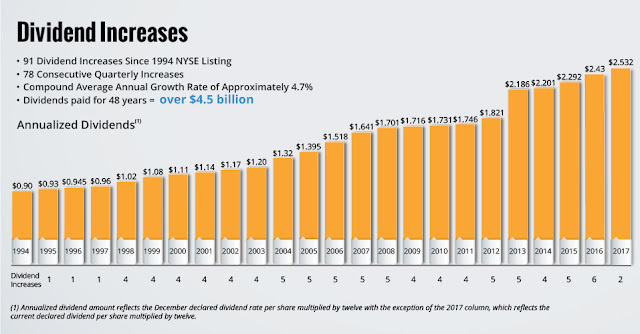 Over the past decade this dividend growth stock has delivered an annualized total return of 11.50% to its shareholders. While Honeywell (HON) clearly outperformed General Electric during this period, most GE shareholders won’t complain about its performance. I know that General Electric is a very popular stock among investors. The company has been around for over 100 years, and has performed quite well for decades. However, I believe the current bull market is hiding many flaw, and Honeywell is a better option for those who look at adding an industrial stock to their portfolio. Ironically, Honeywell failed to merge with General Electric back in 2001. As part of my monitoring process, I evaluate the list of dividend increases every week. This exercise helps me observe the rate of dividend growth for companies I own. It also helps me to familiarize myself with other dividend growth companies. I also believe that running through the list, and narrowing it down to a more manageable level using my screening criteria is helpful to readers for educational purposes. I find it helpful to run through the exercise of narrowing the list of companies that raised dividends in a given week, by focusing on those that have raised dividends for at least ten years in a row. I also find it helpful to then evaluate each company quickly, using my well-publicized entry criteria, and then zooming in further on the fundamental performance and valuation criteria in order to determine whether a stock is worth a further look today. This is the type of decision making that goes in my head while I review different companies. On April 3rd, 2017, Buffett’s Berkshire Hathaway (BRK.B) will receive $148 million dollars in dividend income from their 400 million shares of Coca-Cola (KO). This comes out to roughly $1.644 million in dividend income per day, $68,500 dollars in dividend income per hour, $1142 dollars in dividend income for Berkshire Hathaway every minute, or almost $19.03 every single second. Those shares have a cost basis of $1.29 billion dollars, and were acquired between 1988 – 1994. This comes out to $3.25/share. The annual dividend payment produces an yield on cost of over 45.60%. This doesn’t assume dividend reinvestment and is 4 – 5 times higher than what investors in 30 year US Treasuries would be earning today. This is why I believe that Warren Buffett is a closet dividend investor. This is a testament to the power of long-term dividend investing, where time in market is the investors best ally, not timing the market. If you can select a business which is run by able and honest management, which has solid competitive advantages, and which is available at a good price today, one needs to only sit and let the power of compounding do the heavy lifting for them. As Buffett likes to say, time is a great ally for the good business. In the case of Coca-Cola, the past 29 years have been a great time to buy and hold the stock. The company has been able to tap emerging markets in Eastern Europe, Asia, Africa and Latin America like never before. As a result, it has been able to receive a higher share of the worldwide drinks market, which has also been expanding as well. If you add in strategic acquisitions, new product development, cost containment initiatives and streamlining of operations, you have a very powerful force for delivering solid shareholder returns. With dividend investing your are rewarded for smart decisions you have made years before.